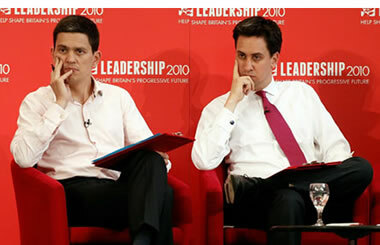 The closeness of the race between the two brothers is illustrated by the fact that individual endorsements by former Labour party ministers have had an impact on voting, most notable of which was the endorsement of David Miliband by the former Business Minister Peter Mandelson, which was seen to be hugely detrimental to David Miliband's lead as Peter Mandelson was blamed by many for losing Labour the May 2010 general election and then virtually immediately going on to cash in on Labours problems with his new book. As things stand probability favours David Miliband winning as he leads with the MP's and Labour party members whilst Ed Miliband leads with the Unions, each of whom have 1/3rd share of the vote. The reason why the 5 horse race is far closer than expected is because if the winning candidate does not get 50% of the vote then voter second preferences are taken into account as candidates with the least votes are eliminated and their second preferences votes distributed to the remaining candidates until one achieves more than 50% of the vote. Therefore in a surprise outcome, David could be a clear winner on as high as 49% of the vote, but still lose on the second preferences where Ed Miliband leads. Though the close race is more akin to that of Miliband household family politics than an truly open leadership election campaign as I pointed out at the start in May 2010 (23 May 2010 - Reasons Why Labour Lost the Election and the Leadership Candidates ). Therefore David Miliband (unless their is a surprise win for his Brother Ed as a consequence of Labours election system) will lead a Labour party that suffers from collective amnesia for putting Britain firmly on the path towards bankruptcy as the icing on the cake for a catalog of grossly incompetent decisions such as the illegal invasion of Iraq, that are more the actions of a far right wing Tory party than a Labour party which just illustrates that Tony Blair was never real Labour but rather a Tory in Sheep's clothing. The Labour party will now seek to undermine the coalition governments necessary programme of spending cuts to prevent inevitable bankruptcy which would culminate in an hyper inflationary event where the people of Britain would see the value of their life savings and purchasing power of earnings evaporate amidst a bond and currency market led panic in the rush to dump fiat currency for any consumer goods and hard assets as their fiat paper (sterling) lost its value. Instead of attacking government cuts, Labour would be far better served by developing a coherent alternative plan for managing and running the economy as the people of Britain are not stupid, they fully understand the dire nature of the countries finances where every single month that is delayed results in an worsening of the debt crisis so will not fall for undeliverable promises of no cuts and increased spending all of which will go to ensure that Labour will not win the next election. In this respect David Miliband is more likely to represent a coherent alternative government then his more left leaning brother Ed. Labours debt and deficit legacy for Britain of out of control public spending is illustrated by the below graph. When Labour came to power government spending was at £318 billion which allowing for inflation would by end of 2009-10 stand at £408 billion. However Labour has spent an extra £270 billion over this as Labour continued to run a budget deficit even during the boom years which has today left the country with an annual budget hole of £150 billion. To say that the public sector has become bloated under Labour is an understatement as it is probably 25% larger than it should be i.e. government spending should be in the region of £508 billion instead of the current £680 billion. Actual Labour government debt would have been at least £100 billion higher than Labours March 2010 forecast, as Labour has consistently failed to meet its budget targets therefore actual total public sector net debt by 2013-14 would have been £1.4+ trillion or about 88% of GDP. The coalition government is attempting to get a grip on the annual budget deficit, which whilst they represent an improvement under the Labour governments target that would have resulted in extra borrowing of £478 billion over the next 4 years if the Labour government managed to stick to its targets. However the ConLib government will still expand total debt by £414 billion over the next 4 years, and £471 billion over the next 6 years to reach £1,242 billion, which illustrates the dire state of the countries finances that really do risk bankrupting Britain as public debt represents a mere tip of the government debt and liabilities ice berg. Total liabilities continue to target approx £4.5 trillion by 2013-14, (as illustrated by the below graph which was last updated in May 2009), this is despite George Osbourne's emergency deficit cutting budget as a consequence of the latest projections for public sector pensions and european debt default risks, given another financial crisis total liabilities could yet look set to be even higher. All of this is a sitting time bomb that will explode in the government bond markets which will send interest rates sharply higher as illustrated in the Inflation Mega-trend Ebook. The trigger for which could be a string of chain reaction European sovereign debt defaults, regardless of the new governments own programme for deficit reduction which still does nothing to actually halt accumulation of new debt. The response of the Labour party to the debt and deficit legacy is to become deficit deniers where every proposed spending cut is to be fought against. This battle is expected to heat up during October in the run up to and in the aftermath of the announcement of actual spending cuts. “it is economically dangerous and socially divisive to take an extra £40bn out of the economy by 2014-15”. After the battle against the cuts will come the battle against the tax rises, especially the VAT hike in January 2010, something that had labour won they would have also implemented. The bottom line is that the New Government has been handed a scorched earth policy as I warned off over a year ago was Labours goal (31 May 2009 - Labour Governments Bankrupt Scorched Earth UK Economy for the Conservative Government ). There is NO alternative to the planned austerity measures as the alternative would be an accelerating trend towards debt default via high inflation. We are already on that path which is why inflation has been high fro the whole of 2010 which is set against the Bank of England's continuous mantra that is was always just temporary however the real reasons is as I elaborated upon in The Real Reason for Bank of England's Worthless CPI Inflation Forecasts, is that Mervyn King and the Bank of England are not actually making inflation forecasts but rather pumping out always imminently low inflation propaganda so as to prevent a wage price spiral from taking hold in which respect they have succeeded given the 2.7% gap between RPI inflation and average wage rises. Therefore all of the Banks statements and reports are for the sole purpose of TALKING INFLATION lower, and are thus pure propaganda to manage the psychological expectations of the the British Population so as to enable the BoE to better achieve its targets. I don't think it matters much who is Labour leader. The voters won't allow Labour anywhere near government for decades, if ever. 25 Sep 10, 04:31 Labour - Who Cares? Nobody actually cares about what Labour do...they are in the wilderness; the socialist dream has been smashed and even the Lefties are admitting they were wrong. Labour ruined our country!!! Brown wasted billions . Mandelsons Rearguard Action / Scorched Earth Policy which the Hordes of Un Elected Labour Peers conducted from the Lords to undermine the Tory’s will ensure the incoming Tory/LibGovt will have to deal with a Bankrupt Economy , High Unemployment with No Jobs available especially in Manufacturing , Union Militancy & Civil Service Unrest - i.e. Marxist Union Initiated Strikes, 2 costly UnWinable Wars fought by Gallant but Under Equipped troops and rampant securalism. Countless PC Left Wing Students / Quangos / NGO's sabotaging govt policy, Crumbling Infrastucture , Chronic lack of Power Generation, Badly functioning Health & Education Services & Millions of 3rd World Unabsorbable Migrants. There is no MONEY! Labour you failed! Whilst neither are capable of being Prime Minister, for me it would have to be Ed as leader. The thought of David's arrogant, slimey smile plastered across the TV all the time is to much to comprehend. I think Ed is the better of the 2 as he has less attachment to the Blair saga. Also he speaks a language which i understand,unlike the same old new labour which David tends to revert to. The Uks social infrastructure suffered over a decade of Thatcher cut backs and privatisation and it was in an awful state of decline when Labour took control. Labour may have spent billions but thats because the likes of the NHS and education,housing and the like were in a desperate way. Now it seems the Condems are stuck somewhere in the middle of the road and will try to pacify both sides of the social justice equation.